Two excellent waterfront apartments - which one best suits your holiday home needs? 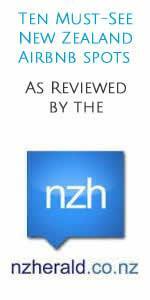 Riverside Apartment was reviewed as one of the 'ten must-see New Zealand Airbnb spots' by the New Zealand Herald. Book directly with us for the best rates, guaranteed. Here's why we were reviewed so highly. Perhaps the first thing you will notice when you arrive at your Riverside Apartment are the amazing views. 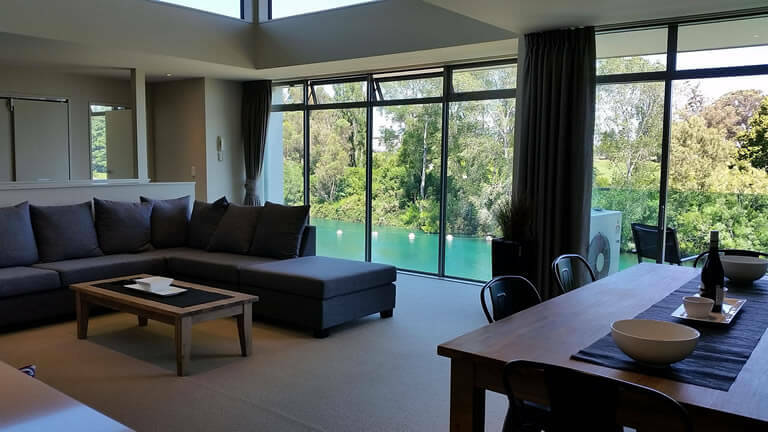 Floor-to-ceiling double glazing allows panoramic vistas of the wide, blue Waikato River passing below and across to the green open space of the domain. These views can be taken in from the kitchen, dining, living area, balcony and the master bedroom - they are truly spectacular. Two queen sized beds are complimented by four bunk beds in the third bedroom. A portacot is also available. The master bedroom takes in the same magnificent view that the living and dining areas overlook. The living area is wonderfully arranged all on one level making living easy. Spacious, beautifully finished and furnished you'll feel at home immediately. Spread out, enjoy the space and relax so that you truly enjoy the view that the apartment offers over the river to the tree-lined domain. Kick back on the balcony to enjoy the late evening sun and enjoy the serenity that this tranquil riverfront apartment can offer. Two bedrooms. Wonderfully positioned on the eastern end of the Watermark Villa complex, Riverside Apartment Two catches all of the morning and afternoon sun. Two bedrooms configured in a queen / two-single layout are complimented by the abilty to sleep an additional two people on a sofa-bed in the lounge if necessary. Spectacular water views are assured from the master bedroom, lounge, living and dining areas. If you are a couple travelling with children you will appreciate the architecturally-designed layout of this apartment that places the second bedroom in the rear of the apartment - leaving the living room for your well-deserved peace and tranquility. The lounge comes complete with flat-screen TV and audio soundbar and of course the wifi is free, unlimited and fast. From the balcony look across the river to the grassy expanse of the Tongariro domain, or up the river to the Taupo Boat Harbour and marina. Enjoy your quiet time with an evening drink on the large balcony and take in the great river views. Riverside Apartment Two is our newest aquisition so it has been fitted out with fantastic furniture, artwork and home wares. Both apartments allow free use of the swimming pool (summer months, please check for availability and whether it will be heated) and all facilites of the Watermark Villas complex. You can prepare meals in the fully appointed kitchen and savour a glass of wine while taking in the relaxing, views of the river gliding past the front of the apartment. The kitchen is fitted with oven, ceramic hob, range hood refridgerator, microwave oven and other small appliances. Or, a ten minute stroll finds you in the centre of Taupo township, with its many restaurants, bars, cafes, boutique art galleries and shops. 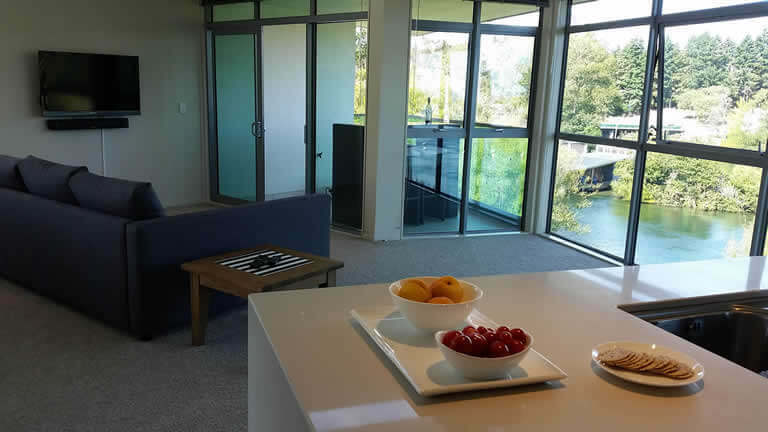 Riverside Apartment is conveniently placed close to Taupo town but enjoys absolute tranquility, away from roads and noise. Found on the shore of Australasia's largest fresh water lake, Taupo is world famous as New Zealand's North Island playground. Adrenaline-pumping activities include bungy-jumping, jet boating, white water rafting and skydiving. If that's just a little too much excitement you can bike the lake trails, hike through native bush or explore the many cultural and historical sites in the area. Check out the many things to do including the famous Tongariro Alpine Crossing. 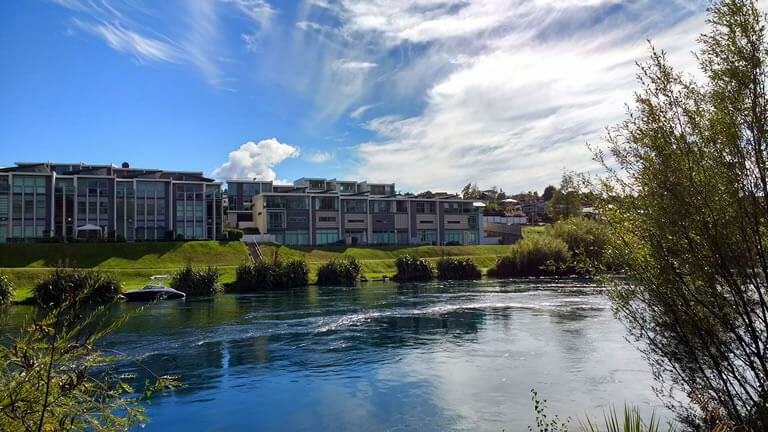 Home to a series of events (mostly in summer) the Taupo domain and amphitheatre is literally just across the river from our apartment - so you can open up the sliding doors and listen to concerts for free and from the comfort of the apartment! Check out our events page for more information on future concerts and we also have some Taupo kid-friendly activities that we can recommend. The thermal wonderland that surrounds Taupo offers a glimpse into its fiery origin. 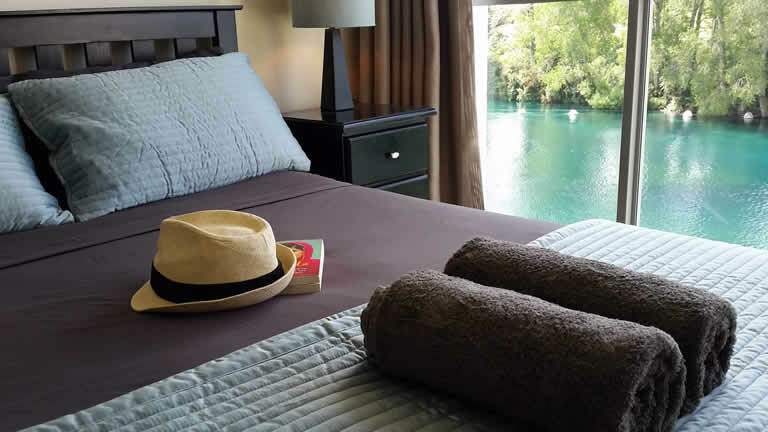 Lake Taupo was predominantly created by a volcanic blast some 26,000 years ago - geysers, boiling mud pools and warm, geothermal hotpools are all within easy reach of Riverside Apartment. Wind down in one of the towns' many cafes, bars or restaurants - or indulge in perhaps the best view of all from the lounge of our apartment and plan what lies ahead for tomorrow. Free Wifi, free Netflix and more. Riverside One (three bedroom apartment) has, in addition to the curved TV, FreeView digital TV channels, (free) wireless internet and bluetooth soundbar for your listening pleasure. Complimentary Netflix is also available for our guests. Riverside Two (two bedroom apartment) is fitted out with flatscreen TV and a soundbar audio system (with bluetooth connectivity). Wifi / internet is available and of course complimentary for our guests. Free Netflix is also available in Riverside Two (live free-to-air TV channels are also available). 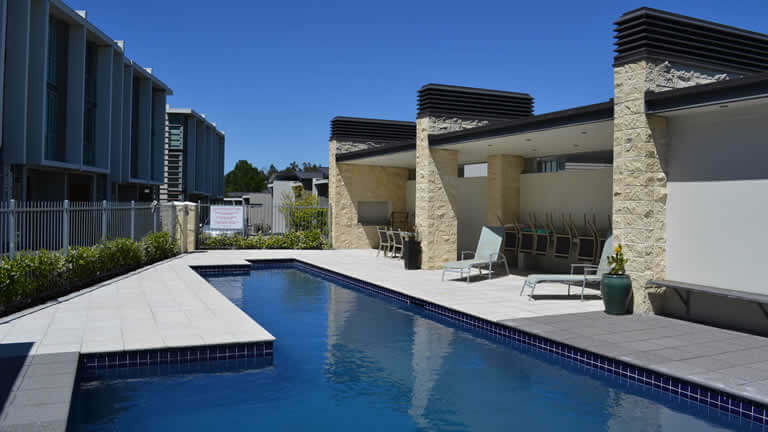 The Watermark Villas complex has a heated swimming pool - heated from October (Labour Weekend) to April (Easter) available for use by our guests. Perfect for a relaxing daily swim and of course and the kids will love it. Please note that over the winter months the pool may not be available for swimming - please contact us to confirm availability if this is important. In addition to the pool, both apartments have two kayaks for the exclusive use of guests. They are ultra-stable 'sit-on' style for safety and with us being right by the river so easy to launch for a quick paddle, or try your luck at fishing in the lake. The kids will love them and we have provided two adult and two children's buoyancy vests. Kayaks for Riverside One are two-double kayaks and for Riverside Two there is a double and single. Your hosts are Linda and Greg, whose love for travel and their own experiences have led them to develop some of the best holiday accommodation experiences you'll find in Taupo. Whether you are a tourist on your first trip to this incredible region or a regular visitor they want to make your stay special and look forward to welcoming you to Riverside Apartment. Please contact us with your questions or make a booking request.